The Toshiba Satellite C855-14R is a mid range notebook which is aimed at the sub £400 laptop market in the UK. Featuring a polished deep red casing, an the Intel i5-2450M processor, complete with 6GB Ram and a generous 640GB Hard drive, this 15.6" laptop will have a wide appeal to consumers, being suitable from everyone from students to commuters. Running on the stable Windows 7 Home Premium, and featuring a crisp 15.6" display, the Toshiba C855-14R offers good value for money, and is worth considering if you are in the market for a mid priced notebook. Read on for our in-depth review. Below is our review of the Toshiba Satellite C855-14R, a 15.6" laptop, featuring 6GB RAM, 640GB hard drive and Windows 7 Home Premium. The first thing you notice upon unboxing the Toshiba Satellite C855-14R is the colour. Finished in a deep red coloured, the polished casing may not be to everyone's tastes. In an era where a certain technology manufacturer has established itself as one of the world's largest companies due to in no small part focusing it's attention on the design of products, this choice of finish is a bold decision by Toshiba. 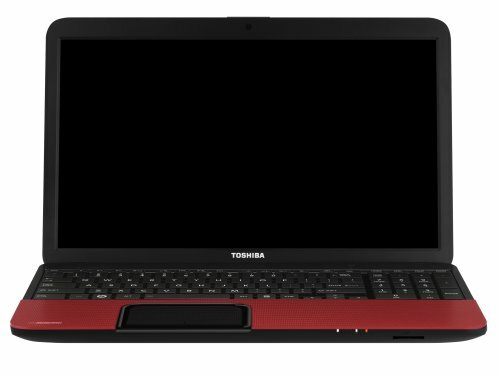 Consumers are renowned for being fickle and choosing style over substance, and in such a competitive market as notebooks, Toshiba have stuck their neck out and plumped for an unusual colour choice, compared to their rivals who have for the most part chosen neutral metallic, black, white and silver finishes. The colour of a laptop obviously has absolutely no bearing on it's function and usability - however it will affect sales, and having mass appeal is essential in such a mainstream industry. Our testers liked this laptop, but preferred the more unstated designs of Samsung and Sony in this price bracket - however this is a personal choice, and as such it would not be fair to fault the laptop in this department. In terms of shape, the laptop is fairly standard - clean straight lines combined with smooth corners - the construction feels solid, and it's unlikely you'll have any issues with every day wear and tear that comes hand in hand with normal usage. So, enough about the design, how practical is the Satellite C855-14R? Even for a so called budget laptop, the keys are full-sized, with a large palm rest. In our experience, Toshiba palm rests get a mixed review fro users. They are comfortable, which ultimately is their intended purpose, however the textured finish can attract dirt and dust, thus making cleaning the notebook more difficult and frequent. A minor criticism, but one that you should bear in mind nonetheless. The actual keys are large, and even spaced, with an easy action - none of us could see any problems with typing on this machine. The key markings are in a contrasting white, making working in a darkened environment possible. Also included is a numerical keypad, which is situated to the right hand side of the body, giving the notebook a degree of practicality for number crunchers and Excel / Sage users. The touch pad is multi touch, enabling you to zoom in and out of web pages as well as navigate with ease - we found no issues with this during our test period - easy to use, accurate and responsive. Onto the components - inside you'll find the Intel Core i5-2450M processor - this is a 2nd generation processor, complete with integrated graphics card, both of which help keep this machine operating at a fast speed. During our test period, we opened several applications and once, and this notebook handled all that we threw at it. At this point we should mention that, as with all notebooks in this price range, it will struggle to play the very latest games at the highest settings, as well as any other high intensity graphics work, such as complex HD video editing. However for simpler games and virtually all regular household use, this notebook will have more than ample computing power to carry out any tasks you require. In addition to the Intel processor, it features a substantial 6gb of Ram, which should help future proof this laptop for several years. The hard drive is a generous 640gb in size, which should provide ample storage for most users - enough for around 7000 mp3 albums, or 192,000 photos - so no issues here. The laptop's screen provides a crisp picture, and none of our testers found any issues with eye strain during our test period, despite working in numerous environments. Toshiba have a good reputation in manufacturing electronic goods including televisions, and this is reflected in the screen of their C855-14R. Battery life we found to be average - not amazing but not poor, with around 4 hours of regular use between charges - if you're after a laptop with considerably longer battery power between charges then ultimately a netbook is probably the best option for you - however we can't criticise the C855-14R in this department. As with virtually all laptops in this price bracket, this notebook comes installed with Windows 7 Home Premium - perfectly functional, and easy enough to customise for users. Connectivity is provided for with the following options: Three USB ports, Ethernet, HDMI, VGA, both headphone and microphone jacks, SD card reader and a DVD player - so more than enough for most users. Speakers were not amazing on this laptop - granted that virtually all laptop speakers are poor when compared to a decent set of external speakers - they are perfectly functional - however we have come across better speakers in similarly priced laptops in our experience. Pros: So why should you buy this laptop? It works pretty fast, features a good display, has a 12 month (at time of writing) return to base Toshiba guarantee, and feels solid - it will offer you years of use. Cons: Cons included the speakers, and the red finish - very much a Marmite love it or hate it type response. To conclude, specification wise this offering from Toshiba provides a lot for a pretty reasonable price tag. The finish might not to be everyone's tastes, but ultimately in terms of how it operates and functions we could only really find fault in the speakers - however this is nothing that a good set of headphones won't sort out.